Sous Lieutenant Eugène Gilbert (19 July 1889 – 17 May 1918) was a World War I flying ace credited with five aerial victories. He had also been a famous pioneer pre-war racing pilot, flying in many countries throughout Europe. 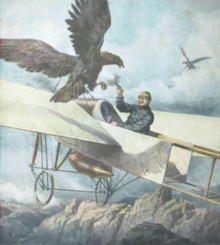 Painting of Gilbert's 1911 encounter with an eagle over Pyrenees. Eugène Gilbert in the cockpit during WW1, 1915. In 1911 Gilbert was called up for military service and with only eight flying lessons made a corporal-aviator. He was forced to leave the army after six months of service following a serious accident during a maneuver, and launched himself at once in sporting competitions where he quickly distinguished himself, flying a Bleriot XI. In the 1911 Paris to Madrid air race, Gilbert flew across the Pyrenees and was attacked by an angry mother eagle defending her young and nest; to ward off the large bird, he simply fired pistol shots at it rather than kill it. In 1912 Gilbert organized an aviation festival with Dr. Antoine Dorel, president of the Automobile Club d'Auvergne. The newspaper Airline Journal reported that flying over Brioude, Gilbert was shot at by an eighty-three year old farmer who took him for "Baret Lou", a demonic bird of prey that casts a curse on crops. Gilbert responded by dropping pamphlets for an advertising campaign "Our future is in the Air" organized by the Michelin firm to promote the military use of aviation. These the farmer interpreted to be feathers of the bird raining down. By 1915, Gilbert was in uniform as a combat pilot with Escadrille MS23. Like fellow French pre-war pilot Adolphe Pegoud, Gilbert was one of the first pilots to become an ace, an aviator who has shot down five or more enemy aircraft. On 27 June 1915 Gilbert was interned after force landing his Morane-Saulnier fighter in Switzerland after bombing the zeppelin sheds at Friedrichshafen. He later succeeded in escaping from captivity and returning to France. He was killed on 17 May 1918 when test-flying a new aircraft at Villacoublay. ^ Daniel, Clifton, ed., Chronicle of the 20th Century, Mount Kisco, New York: Chronicle Publications, 1987, ISBN 0-942191-01-3, p. 171. ^ "Performances de la Quinzaine". l'Aérophile: 301. 1 July 1914.